Bella and Edwards romantic honeymoon getaway becomes a nightmare in Breaking Dawn Part 1. Kidzworld has the movie review. 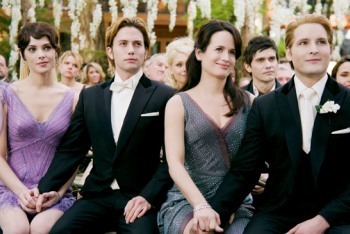 Bella and Edward’s wedding is just around the corner, and Bella is suffering from terrifying nightmares. But as she walks down the aisle on her father’s arm and greets Edward at the altar, everything becomes right with the world. Afterwards, Edward whisks her away to a surprise honeymoon destination - the private island of Esme, located off the coast of Rio. A night of passion leaves the couple satisfied. 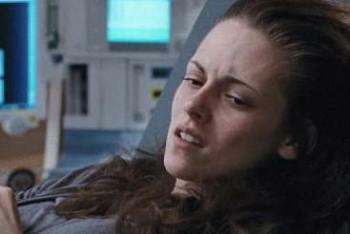 But Edward refuses to sleep with her again after the bruises he inflicted on her, despite Bella’s attempt to seduce him. When Bella starts to feel morning sickness followed by something moving inside of her, she knows that something’s wrong. It’s not supposed to be possible for vampires to reproduce, but somehow, someway, Bella is pregnant. As the baby grows rapidly inside of her, it begins to absorb all of her nutrition, reducing Bella to skin and bone. Everyone fears that the baby will kill her, but Bella refuses to abort the pregnancy. Unfortunately, taking this risk puts not only herself, but also the Cullen’s, in danger. If this vampire baby kills Bella - a human - then the treaty between the Quileute tribe and the vampires will be void. And the werewolves can move in for the long-awaited kill. Dividing this movie into two parts leaves the plots in both films pretty thin. But the filmmakers did a great job with what they had to work with. The way Bella’s body deteriorated during her pregnancy was horrific but fascinating, and the chance of Bella's death grew more and more likely as the movie played out. Breaking Dawn Part 1 is the best film in the Twilight Saga so far! What did you think of Breaking Dawn Part 1? Tell us in our comment section below!